BrighterMelon offers fruit carving displays for weddings, catering events, open houses, birthdays, baby showers, dinner parties, gifts, etc. 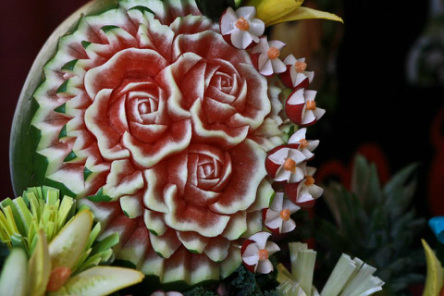 BrighterMelon's carvings will leave your guest's talking. We are able to personalize your melon with special names, sayings, or dates for whatever your occasion may be. If interested in booking an event with BrighterMelon just click on the Contact Us link and fill out the contact information form and BrighterMelon will contact you as soon as possible.